Ekonomia arloan eta aspalditik oso ezaguna dugunez, Europako Ezkerra galduta dago erabat. Kasu, Brexit dela eta, ez dakite ezer, ez dute ahalmenik ere ez Brexit bera ulertzeko. Eta Euskal Herrian? Harrigarria bada ere, ezjakintasuna are sakonagoa da gure artean. Irakur edo/eta entzun EHko komunikabideetan agertzen dena! Benetan lotsagarria! Eta politika mailan? Antzekoa edo eta okerragoko egoeran! Zer esan EHri buruz, non faltsukeria hutsa den, eta inongo zentzu politikorik, ezta internazionalik ere, ez daukan, eta progre guztiek etengabe erabiltzen duten sasiko ‘derecho a decidir‘ (sic) modan jarri den? “La monnaie britannique a encore reculé cette semaine. Cette chute réveille le risque de “stagflation”, mais elle annonce aussi un rééquilibrage inévitable de l’économie du Royaume-Uni. La livre sterling a continué à reculer au cours de la semaine passée. Vendredi, il fallait encore un peu plus de 1,22 livre pour un dollar étasunien contre 1,2434 livre lundi 7 octobre et 1,108 livre pour un euro contre 1,11 livre. Depuis le 23 juin, la dépréciation de la monnaie de Sa Majesté Britannique approche les 18 % face au dollar des Etats-Unis et 15 % face à l’euro. La décision de la première ministre britannique Theresa May de prendre le risque d’un « Brexit dur », autrement dit d’une absence d’accord commercial avec l’UE, a accéléré ce mouvement. Perte du statut de monnaie de réserve ? It signals, some say, that investors have lost confidence in Britain because it will trade less with the European Union and hence will be poorer in the future. Others insist that the drop in the pound’s value makes the British public poorer already because they can buy less foreign currency and, hence, fewer goods and services abroad. British holiday-makers, says former Bank of England deputy governor Rupert Pennant-Rea, are the first to feel the shock of the weaker pound. Those who take a more positive view of Brexit point to the smart recovery in stock markets. What is going on? 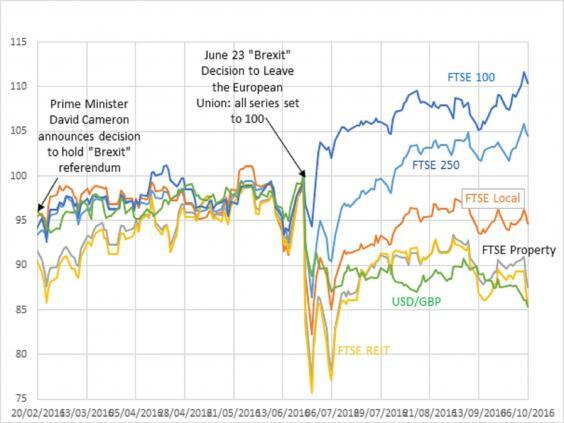 A careful look at market indicators suggests that far from being the disaster being portrayed, Brexit may have been a boon. The composite picture from financial markets tells the following story. Britain within the European Union became a magnet for speculative international financial capital. From its unrivalled role as financial gateway to Europe, arose a property-buying frenzy in London and neighbouring districts. British banks channelled foreign speculative capital, and the finance-property bubble became a central feature of the British economy. Believing it was here to stay, even Russian oligarchs and Indian billionaires thought the craziness was a safe investment. Silently but damagingly, the finance-property bubble also bid up the value of the pound, causing the pound to become overvalued for all other sectors of the British economy. Britain, quite literally, was living on borrowed time. It is true that with an overvalued pound, the British public could command more foreign goods and services with their currency. But British producers lost competitiveness at home and abroad. Producers’ incentives to invest were weakened, leading to Britain’s poor productivity performance. And that led to a large current account deficit. As a simple matter of arithmetic, the people of Britain were not richer before Brexit. To the contrary, they were living beyond their means. And so the sense that the British public was richer because the pound was stronger was an illusion. To the extent the finance-property bubble was sowing the seeds of a financial crisis, Britain was living under a dangerous illusion. Brexit has fortuitously corrected this long-standing distortion in the British economy. It is now easy to see why stock indices are going up. The depreciation of the pound has corrected an overvaluation of the pound, improving the prospects of domestic producers. And after Brexit, Carney’s drumbeat about the need to protect the economy through lower interest rates and quantitative easing was evidently misguided. It mainly stirred up fear while providing little help to struggling producers. Easier monetary policy has, however, kept the property bubble from deflating even faster. While several factors led to the Brexit vote, make no mistake, many were protesting that they had been left off the table where the economic pie is divided. If the pound is about 20 per cent overvalued, then the fuss about the laughably trivial few percentage points increase in tariffs after leaving the European Union is really beside the point. The pound has depreciated by about 15 per cent since Brexit, and has another 5, possibly 10, per cent go to before it stabilises at around $1.1 dollars per pound. Rather than imposing a long-term cost, Brexit may, through a more reasonably priced pound, help expand British trade and productivity.